Harvey P. Ames was born on 7 January 1901 at Wisconsin. Harvey P. Ames died in August 1979 at age 78. 1 June 1905 Potosi, Grant, Wisconsin Harvey P. Ames is listed as son on the census of 1 June 1905 in the household of Sarah Sophia Kreiser at Potosi, Grant, Wisconsin. Harvey P. Ames obtained US Social Security Card at Wisconsin; last residence Lancaster, Grant, Wisconsin. George J. Ames was born on 19 March 1899 at Wisconsin. As of 1942, George J. Ames was never married. He died in March 1978. 1 June 1905 Potosi, Grant, Wisconsin George J. Ames is listed as son on the census of 1 June 1905 in the household of Sarah Sophia Kreiser at Potosi, Grant, Wisconsin.
. On 6 October 1942 at U.S. World War II Army Enlistment, Carroll, Illinois, Name: George J Ames Birth Year: 1899 Race: White, citizen (White) Nativity State or Country: Wisconsin State: Illinois County or City: Carroll Enlistment Date: 6 Oct 1942 Enlistment State: Wisconsin Enlistment City: Milwaukee Branch: Branch Immaterial - Warrant Officers, USA Branch Code: Branch Immaterial - Warrant Officers, USA Grade: Private Grade Code: Private Term of Enlistment: Enlistment for the duration of the War or other emergency, plus six months, subject to the discretion of the President or otherwise according to law Component: Selectees (Enlisted Men) Source: Enlisted Man, Regular Army, after 3 months of Discharge Education: 4 years of high school Civil Occupation: Wire Chief, Telephone And Telegraph Marital Status: Single, without dependents Height: 66 Weight: 185. Clifford L. Ames was born on 5 December 1912 at Wisconsin. He was the son of Jacob William Ames and Sarah Sophia Kreiser. Clifford L. Ames died on 4 January 1998 at age 85. Clifford L. Ames obtained US Social Security Card at Wisconsin; last residence Marshfield, Wood, Wisconsin. On 30 October 1940 at U.S. World War II Army Enlistment, Cedar Rapids, Iowa, Name: Clifford Ames Birth Year: 1912 Race: White, citizen (White) Nativity State or Country: Wisconsin State: Wisconsin County or City: Grant Enlistment Date: 30 Oct 1940 Enlistment State: Iowa Enlistment City: Cedar Rapids Branch: Field Artillery Branch Code: Field Artillery Grade: Private Grade Code: Private Term of Enlistment: Enlistment for assignment to another corps area Component: Regular Army (including Officers, Nurses, Warrant Officers, and Enlisted Men) Source: Civil Life Education: Grammar school Marital Status: Single, without dependents Height: 67 Weight: 135. William A. Ames was born in October 1892 at Wisconsin. 1 June 1905 Potosi, Grant, Wisconsin William A. Ames is listed as son on the census of 1 June 1905 in the household of Sarah Sophia Kreiser at Potosi, Grant, Wisconsin. Married Name 29 May 1905 As of 29 May 1905,her married name was Ames. Anna K. Goldhagen was born on 11 June 1884 at Burlington, Wisconsin. She was the daughter of Andreas Fredrick Goldhagen and Katherina Frommelt. Anna K. Goldhagen married John Ames, son of Jacob Ames and Mary Ward, on 29 May 1905. Anna K. Goldhagen died in 1963 at Waterloo, Iowa. Married Name 17 September 1927 As of 17 September 1927,her married name was Wilson. Bernice Mary Ames was born on 24 April 1906. She was the daughter of John Ames and Anna K. Goldhagen. Bernice Mary Ames married Ellsworth S. Wilson, son of William Wilson and Zelma Burrows, on 17 September 1927. Bernice Mary Ames died in 1961 at Los Angeles, California. Donald Ames was born on 18 September 1906 at Waterloo, Iowa. He was the son of John Ames and Anna K. Goldhagen. Donald Ames died in 1918 at Waterloo, Iowa. Name Variation Elmer F. Ames was also known as Al. Elmer F. Ames was born in 1909. Elmer F. Ames died in 1999. Name Variation Sylvester James Ames was also known as Babe. Sylvester James Ames was born in 1911. Sylvester James Ames died in 1991. Evelyn Ames was born in 1913. Madeline Ames was born on 10 December 1916 at Waterloo, Iowa. Madeline Ames died on 27 October 1999 at age 82. Name Variation Elliott Ames was also known as Bus. Elliott Ames was born on 25 May 1919 at Waterloo, Iowa. Name Variation Lester Ames was also known as Les. Lester Ames was born on 21 October 1921 at Waterloo, Iowa. Lester Ames died on 9 March 1999 at age 77. Name Variation Andreas Fredrick Goldhagen was also known as Fred. Andreas Fredrick Goldhagen married Katherina Frommelt. Andreas Fredrick Goldhagen was born on 3 December 1852. He died on 6 March 1915 at age 62. Name Variation Katherina Frommelt was also known as Katie. Married Name Her married name was Goldhagen. Name Variation Katherina Frommelt was also known as Katy. Katherina Frommelt married Andreas Fredrick Goldhagen. Katherina Frommelt was born on 23 December 1858. She died on 14 July 1940 at age 81. Ellsworth S. Wilson was born on 11 August 1903 at Mitchell, South Dakota. He was the son of William Wilson and Zelma Burrows. Ellsworth S. Wilson married Bernice Mary Ames, daughter of John Ames and Anna K. Goldhagen, on 17 September 1927. Ellsworth S. Wilson died in 1971 at Waterloo, Iowa. William Wilson married Zelma Burrows. Zelma Burrows married William Wilson. Ellsworth Wilson died on 13 November 1931 at Waterloo, Iowa. He was born on 13 November 1931 at Waterloo, Iowa. He was the son of Ellsworth S. Wilson and Bernice Mary Ames. Christian Kreiser was born in October 1863 at Wisconsin. He was the son of Christian Jacob Kreiser Sr. and Margaret Schambauch. As of 1930, Christian Kreiser was never married. [S247] U.S. Federal Census 1870 U.S. Federal Census, by Ancestry.com, Page 29. Dwelling 209. [S245] U.S. Federal Census 1900 U.S. Federal Census, by Ancestry.com, ED51. Dwelling 206. [S364] Wisconsin State Census Wisconsin State Censuses, 1895 and 1905, by Ancestry.com, Dwelling 30. [S244] U.S. Federal Census 1910 U.S. Federal Census, by Ancestry.com, ED43. Dwelling 139. Name Variation Frank P. Kreiser was also known as Frank John. Frank P. Kreiser was born circa 1865 at Wisconsin. Frank P. Kreiser married Elizabeth Mary Klein, daughter of Joseph Klein and Emma Frances Kehrer, on 22 July 1893 at Grant, Wisconsin. Frank P. Kreiser died after March 1920. [S245] U.S. Federal Census 1900 U.S. Federal Census, by Ancestry.com, ED43. Dwelling 234. [S243] U.S. Federal Census 1920 U.S. Federal Census, by Ancestry.com, ED110. Dwelling 46. Eva Kreiser was born in December 1868 at Wisconsin. As of 1930, Eva Kreiser was never married. Name Variation Fredericka Margaret Kreiser was also known as Henericca. Name Variation Fredericka Margaret Kreiser was also known as Rica. Name Variation Fredericka Margaret Kreiser was also known as Ricca. Married Name 11 July 1893 As of 11 July 1893,her married name was Ames. Fredericka Margaret Kreiser was born on 29 January 1869 at Potosi, Grant, Wisconsin. Fredericka Margaret Kreiser married Andrew Ames, son of Nicholas Ames and Christina M. Scholl, on 11 July 1893 at Grant, Wisconsin. Fredericka Margaret Kreiser died on 17 July 1965 at age 96. Fredericka Margaret Kreiser had 8 with 7 living in 1910 children. 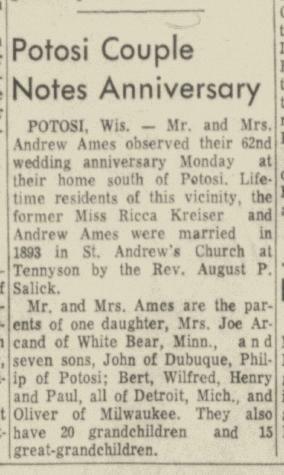 On 11 July 1955 Andrew and Fredericka (Kreiser) Ames 62nd wedding anniversary celebration. 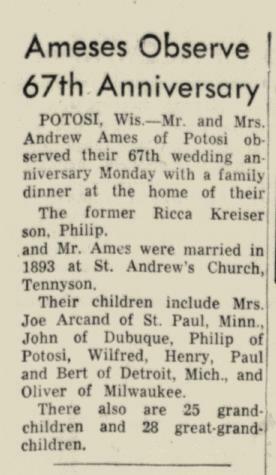 In 1960 Andrew and Fredericka (Kreiser) Ames 67th wedding anniversary celebration. Name Variation Johann Gottfried Kreiser was also known as Godfrey. Name Variation Johann Gottfried Kreiser was also known as Kreÿser. Name Variation Johann Gottfried Kreiser was also known as Godfry. Name Variation Johann Gottfried Kreiser was also known as Gotfred. Johann Gottfried Kreiser was born on 20 July 1804 at Brackenheim, Württemberg, Germany. He was baptized on 21 July 1804 at Brackenheim, Württemberg, Germany. He married Eva Maria Fehrle on 15 February 1835 at Evangelisch, Brackenheim, Neckarkreis, Wuerttemberg, Germany. Johann Gottfried Kreiser died after 1880. 1840 Western Division, Grant, Wisconsin Territory Johann Gottfried Kreiser appeared on the census of 1840 at Western Division, Grant, Wisconsin Territory, also includes one male age 50-60. Family table of Johann Gottfried Kreiser - Wurttemberg, Germany. Johann Gottfried Kreiser and Eva Maria Fehrle immigrated on 31 October 1838 also reported as 1837; Port of Departure: Bremen, Germany, Port of Arrival: New York, New York, Ship Name: Venus. [S249] U.S. Federal Census 1850 U.S. Federal Census, by Ancestry.com, Stamp 58. Dwelling 823. [S248] U.S. Federal Census 1860 U.S. Federal Census, by Ancestry.com, Dwelling 407. Name Variation Eva Maria Fehrle was also known as Mary. Married Name 15 February 1835 As of 15 February 1835,her married name was Kreÿser. Married Name 15 February 1835 As of 15 February 1835,her married name was Kreiser. Eva Maria Fehrle was born on 9 May 1809 at Botenheim, Württemberg, Germany. She married Johann Gottfried Kreiser on 15 February 1835 at Evangelisch, Brackenheim, Neckarkreis, Wuerttemberg, Germany. Eva Maria Fehrle died after 1880. 1840 Western Division, Grant, Wisconsin Territory Eva Maria Fehrle is counted on the census of 1840 in the household of Johann Gottfried Kreiser at Western Division, Grant, Wisconsin Territory; also includes one male age 50-60. Family table of Johann Gottfried Kreiser - Wurttemberg, Germany. Eva Maria Fehrle and Johann Gottfried Kreiser immigrated on 31 October 1838 also reported as 1837; Port of Departure: Bremen, Germany, Port of Arrival: New York, New York, Ship Name: Venus. Name Variation Catherine Peter was also known as Kreiser. Catherine Peter was born circa 1852 at Wisconsin. She was the daughter of (?) Peter and Margaret Schambauch. [S248] U.S. Federal Census 1860 U.S. Federal Census, by Ancestry.com, Dwelling 406. Eva Kreiser was born circa 1858 at Wisconsin. Eva Kreiser died before 1868. (?) Peter married Margaret Schambauch before 1852. (?) Peter died before November 1854. Name Variation Albert F. Bitzberger was also known as Al. Albert F. Bitzberger was born on 1 November 1889 at Iowa. He was the son of Frank Lester Bitzberger and Johanna Francis Ames. As of 1925, Albert F. Bitzberger was never married. 1 June 1925 Dubuque Precinct 7, Dubuque, Iowa Albert F. Bitzberger is listed as son on the census of 1 June 1925 in the household of Johanna Francis Ames at Dubuque Precinct 7, Dubuque, Iowa. On 5 June 1917 at World War I Draft Registration, Dubuque, Dubuque, Iowa. [S250] U.S. Federal Census 1930 U.S. Federal Census, by Ancestry.com, ED27. Dwelling 297. Frank Bitzberger was born circa 1902 at Iowa. As of 1925, Frank Bitzberger was never married. 1 June 1925 Dubuque Precinct 7, Dubuque, Iowa Frank Bitzberger is listed as son on the census of 1 June 1925 in the household of Johanna Francis Ames at Dubuque Precinct 7, Dubuque, Iowa.